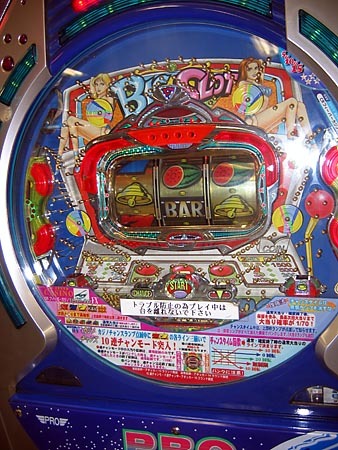 In some arcades they had pachinko machines, without the payoffs pachinko parlours provide. I call it fakechinko. 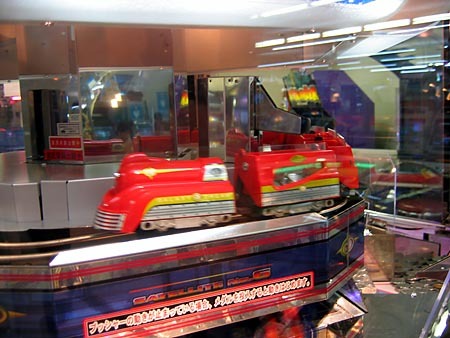 An easy way to tell if you're playing fakechinko is to count the number of machines in the arcade. 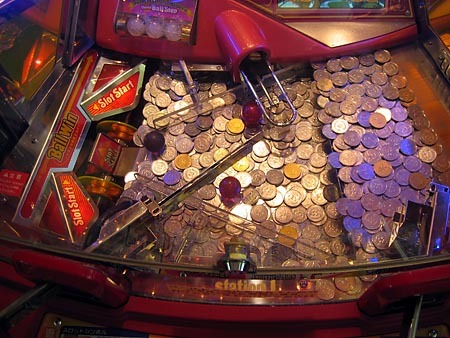 If you pass out before counting them all, you're playing real pachinko! 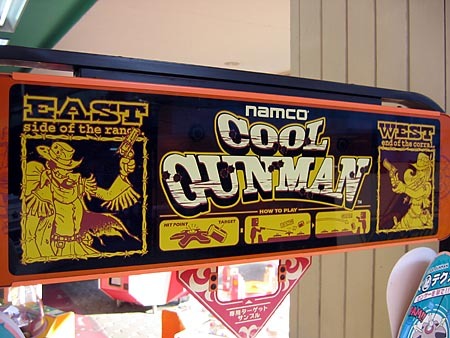 Near the end of the 20th century, Namco developed a number of mechanical arcade games. 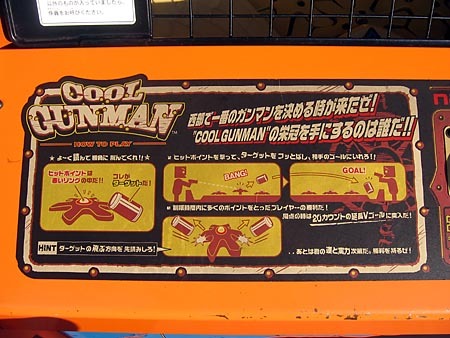 In this 1999 game, "Cool Gunman," you and your opponent each have a light-gun and you use it to shoot flower-shaped pads on the playing field. These "pop," and if you've shot one that the plastic can is resting on, the can will fly into the air. YOUR OBJECTIVE: Get the can into your neighbor's goal. I played it by myself and it was enjoyable. It's a different sort of feeling. A feeling of accomplishment. "Yes, I was able to shoot the can into my opponent's goal, even though I have no opponent." 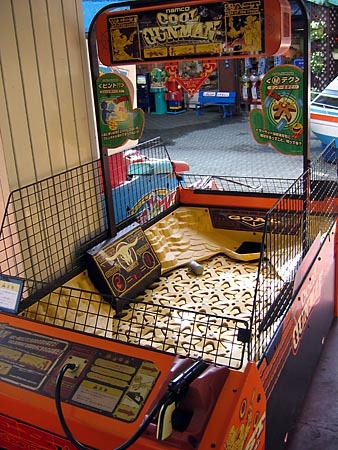 There is a similar game by Namco called Quick & Crash (?) that requires you to "shoot" (again, with the light gun) a plastic mug which blows apart into several pieces -- these all fall into a hole and are magically re-assembled. Truly amazing. 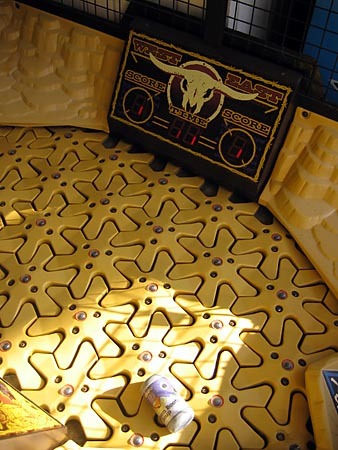 Your score is your trigger time. If my explanation was not clear, you can look at these informative graphics. There are always informative graphics in Japan. They will even appear on bars of chocolate, indicating exactly what ingredient was used to create what substrate. Information we here in America are never given. They must have had a really hard time during development, given the amount of instructions on the machine. They've even pulled out Pac-Man to reassure people ... "It's okay. It's like eating dots on a video screen, except you're shooting something that makes something else fly in the air. Now get to work you coin-toting bastards." 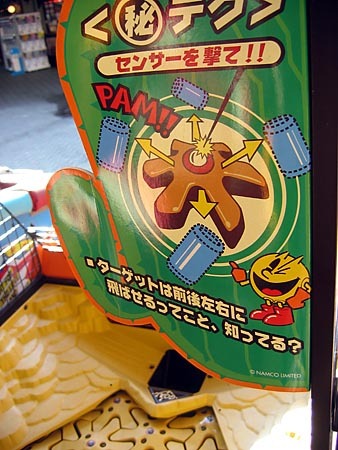 I know very little Japanese, but I know that "pam!!" translates to "ka-pwing!!" This is part of one of those coins-spilling-over-but-they-never-do games. The train has money inside of it. I will now make a reference to the 1995 film Money Train. This is the coin spiller part of the Money Train game.